Log cabins serve a multitude of purposes including spare sleeping accommodation, and as a starter apartment for a teenaged son or daughter. If you are looking to expand your living accommodation and want to avoid the expense of a move or an extension, you need to consider a log cabin in your garden or back yard. If you have space for a trailer or caravan, then you could fit in a log cabin. Many garden centres let space to a supplier of garden buildings and log sheds. Most of these displays are relatively small and you need to visit a specialist’s own show area to see the amazing buildings that are now available for erection in your own garden and usually without planning permission. One way out of unemployment is to start your own business, but office and workshop rental are beyond any new business start-up. If you buy a log cabin to use as a garden office this means you do not need to rent any space, you have no commuting to do and the business is separate from your family home. You will need to specify a log cabin that is adequately insulated to withstand the winter weather, or you can easily upgrade the insulation in any log cabin you buy. Log cabins are available that arrive supplied with plasterboard partitions, plumbing for a bathroom and double-glazing. These can serve a multitude of purposes including spare sleeping accommodation, and as a starter apartment for a teenaged son or daughter. Log cabins can also function as a granny annexe that can be adapted later into an office or teenager accommodation. 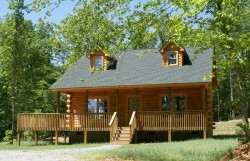 Plumbing and electrical connections to your new log cabin involve a bit of work, but are simple enough to put in place. Farmers in tourist areas build and sell log cabins on their land as rural escapes for either summer use, or year-round use. You can easily find log cabins for sale in Cornwall or Devon for example.